The mantra Om Mani Padme Hum (literally: "Aum, to the Jewel in the Lotus, hum) is recited by Tibetan Buddhists to invoke Chenrezi, the Bodhisattva of Compassion. Repeating this mantra accumulates merit and eases negative karma; meditating upon it is believed to purify the mind and body. Tibetan Tingsha chimes are traditionally used by Tibetan Buddhists to mark the beginning and end of meditation. 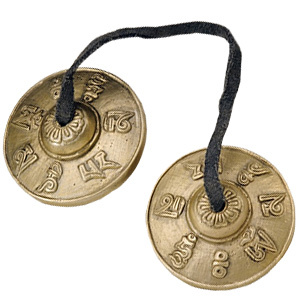 They are also used by a Buddhist master to bring a student back into focus when his mind wanders during meditation. Our chimes are made in Nepal of an alloy of bronze, iron and zinc. The sound is penetrating and purposely dissonant unlike the harmonic overtones of the Tibetan singing bowls. You can chime them by either 1) slightly tapping them together (soft sound) or by 2) holding the leather cord at its center and swinging the chimes together so that they strike each other strongly (loud sound). Over 2 1/2" diameter. Usage: You can chime them by either 1) slightly tapping them together (soft sound) or by 2) holding the leather cord at its center and swinging the chimes together so that they strike each other strongly (loud sound).